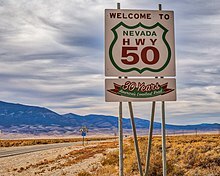 This article is about the section of U.S. Route 50 in Nevada. For the entire route, see U.S. Route 50. U.S. Route 50 (US 50) is a transcontinental highway in the United States, stretching from West Sacramento, California, in the west to Ocean City, Maryland, on the east coast. The Nevada portion crosses the center of the state and was named The Loneliest Road in America by Life magazine in July 1986. The name was intended as a pejorative, but Nevada officials seized it as a marketing slogan. The name originates from large desolate areas traversed by the route, with few or no signs of civilization. The highway crosses several large desert valleys separated by numerous mountain ranges towering over the valley floors, in what is known as the Basin and Range province of the Great Basin. US 50 has a diverse route through the state, traversing the resort communities of Lake Tahoe, the state capital in Carson City, historical sites such as Fort Churchill State Historic Park, petroglyphs, alpine forests, desert valleys, ghost towns, and Great Basin National Park. The route was constructed over a historic corridor, initially used for the Pony Express and Central Overland Route and later for the Lincoln Highway. Before the formation of the U.S. Highway System, most of US 50 in Nevada was designated State Route 2. The routing east of Ely has changed significantly from the original plans. The route change resulted from a rivalry between Nevada and Utah over which transcontinental route was better to serve California-bound traffic, the Lincoln Highway or the Victory Highway. The next services are in the single-building settlement of Middlegate, a roadhouse that has served as a restaurant, bar, hotel, and refueling station since the Pony Express era of the 19th century. The building features Lincoln Highway and Pony Express era artifacts as well as plaques from various historical societies confirming the station is authentic. The station is the modern turnoff to Berlin–Ichthyosaur State Park, a preserved ghost town surrounded by dinosaur remains. US 6/US 50/US 93 crossing Conners Pass near Ely. From west to east US 50 crosses several mountain ranges using 17 passes and one tunnel. Custom sign placed by the Department of Transportation to promote US 50 as The Loneliest Road in America. Note: Mileposts in Nevada reset at county lines. The start and end mileposts in each county are given in the county column. ^ Mileposts east of Ely reflect distance along concurrent US 6. ^ a b c d e f g h Nevada Department of Transportation. "State Maintained Highways of Nevada: Descriptions and Maps" (PDF). Nevada Department of Transportation. Retrieved June 19, 2013. ^ Federal Highway Administration. "National Highway Planning Network GIS data version 2005.08". Federal Highway Administration. Retrieved January 20, 2008. ^ a b c d e f g h Benchmark Maps (2003). Nevada Road and Recreation Atlas (Map) (2003 ed.). 1:280,000. Medford, OR: Benchmark Maps. ISBN 0-929591-81-X. ^ Google (January 26, 2009). "Fallon to Delta" (Map). Google Maps. Google. Retrieved January 26, 2009. ^ Google (January 20, 2009). "Boston to Baltimore" (Map). Google Maps. Google. Retrieved January 20, 2009. ^ Google (January 20, 2009). "Paris to Zurich" (Map). Google Maps. Google. Retrieved January 20, 2009. ^ Nevada Department of Transportation. "2007 Annual Traffic Report". Nevada Department of Transportation. Archived from the original on November 21, 2008. Retrieved February 1, 2009. ^ Munson, Jeff (December 8, 2015). "Stretch of Carson City Freeway Officially Named in Honor of Deputy Carl Howell". Carson Now. Retrieved December 8, 2015. ^ Munson, Jeff (August 16, 2015). "Carson City Deputy Killed in the Line of Duty Identified". Carson Now. Retrieved December 8, 2015. ^ "New Stretch of Freeway Opens in Carson". Reno Gazette Journal. September 25, 2009. ^ Deach, Ben (August 2, 2017). "Freeway Extension to Save Drivers Time in Carson City". Reno, NV: KOLO-TV. Retrieved August 2, 2017. ^ Nevada State Historic Preservation Office. "Forty Mile Desert: Nevada Historical Marker 26". Nevada State Historic Preservation Office. Retrieved February 26, 2008. ^ Nevada State Historic Preservation Office. "Ragtown: Nevada Historical Marker 19". Nevada State Historic Preservation Office. Retrieved June 19, 2013. ^ a b c Nevada Commission on Tourism. "The Official Hwy 50 Survival Guide: The Loneliest Road in America" (PDF). Nevada Commission on Tourism. Archived from the original (PDF) on January 23, 2016. Retrieved May 10, 2016. ^ Bureau of Land Management. "Sand Mountain Recreation Area". Bureau of Land Management. Archived from the original on February 19, 2008. Retrieved March 18, 2008. ^ United States Geological Survey. "Historic Earthquakes". United States Geological Survey. Archived from the original on February 7, 2010. Retrieved March 16, 2008. ^ Center for Land Use Interpretation (2004). "Nevada's Dixie Valley". Center for Land Use Interpretation. Archived from the original on April 14, 2008. Retrieved March 18, 2008. ^ Middlegate Station. "Middlegate Station". Middlegate Station. Retrieved December 15, 2007. ^ Del Cohen, Shayne. "Sagebrush Saloons". Nevada Magazine. Archived from the original on February 26, 2008. Retrieved March 13, 2008. ^ Fagan, Kevin (June 4, 2002). "A Tree with Wole: That Fruit Dangling from the Branches in the Nevada Desert Is Really ... Shoes". San Francisco Chronicle. Retrieved June 19, 2013. ^ Stockwell, Kellene (January 3, 2011). "Highway 50 'Shoe Tree' Cut Down". KTVN. Archived from the original on March 9, 2012. Retrieved January 4, 2011. ^ "The Shoe Tree of Middlegate". Nevada Division of Tourism. Retrieved January 20, 2018. ^ Austin Chamber of Commerce. "History & Ghost Towns". Austin Chamber of Commerce. Archived from the original on February 5, 2009. Retrieved February 16, 2009. ^ Nevada Commission on Tourism. "Eureka, Nevada". Nevada Commission on Tourism. Archived from the original on December 18, 2008. Retrieved January 26, 2009. ^ Eureka County. "Eureka Opera House". Eureka County. Retrieved March 13, 2008. ^ Nevada Commission on Tourism. "Ely, Nevada". Nevada Commission on Tourism. Archived from the original on December 18, 2008. Retrieved February 16, 2009. ^ American Automobile Association (1979). Western States (Map) (1979 ed.). 1:2,534,400. American Automobile Association. ^ Jensen, Jamie (2009). "Connors Pass and Major's Place". Loneliest Road: US-50. Avalon Travel. Retrieved June 24, 2013. ^ Jensen, Jamie (2009). "Great Basin National Park". Loneliest Road: US-50. Avalon Travel. Retrieved June 24, 2013. ^ Nevada Department of Transportation. "Nevada Scenic Byways". Nevada Department of Transportation. Archived from the original on June 10, 2016. Retrieved May 10, 2016. ^ a b Nevada Commission on Tourism. "Highway 50, the Loneliest Road". Nevada Commission on Tourism. Archived from the original on April 19, 2009. Retrieved March 16, 2008. ^ Nevada Department of Transportation (2012). "Named Highways of Nevada" (PDF). Nevada Department of Transportation. Archived from the original (PDF) on April 25, 2013. Retrieved June 19, 2013. ^ Dougan, Michael (March 28, 2004). "America's Not-So-Lonely Road: Looking for Life in the Dead Center of Nevada". San Francisco Chronicle. Retrieved February 2, 2009. ^ Nevada Department of Transportation. "2013 Annual Traffic Report". Nevada Department of Transportation. Archived from the original on August 19, 2014. Retrieved August 14, 2014. ^ Gelbert, Doug (2002). Film and Television Locations: A State-by-State Guidebook to Moviemaking Sites, Excluding Los Angeles. McFarland. p. 44. ISBN 978-0-7864-1293-8. ^ Wiater, Stanley; Golden, Christopher; Wagner, Hank (2001). The Stephen King Universe: A Guide to the Worlds of the King of Horror. Macmillan. p. 416. ISBN 1-58063-160-6. Retrieved March 10, 2009. ^ Shaputis, June. "Highway 50: The Loneliest Road in America Through White Pine County, Nevada". White Pine County Historical Society. Archived from the original on January 20, 2008. Retrieved January 27, 2009. ^ Peart, Neal (2002). Ghost Rider: Travels on the Healing Road. ECW Press. p. 130. ISBN 978-1-55022-546-4. ^ "Top Gear Series 12 Episode 2 (Part 2)". 12. Episode 2. 9 November 2008. BBC. BBC Two. Retrieved 2 July 2013. ^ Weingroff, Richard F. "The Lincoln Highway". Federal Highway Administration. Retrieved January 21, 2009. ^ Johnston, Charlie. "Pony Express". Nevada Magazine. Archived from the original on October 7, 2011. Retrieved September 9, 2011. ^ a b c d Nevada Department of Transportation. "Historical Maps 1927 and 1952". Nevada Department of Transportation. Archived from the original on August 9, 2013. Retrieved June 19, 2013. ^ Lincoln Highway Association. "The Lincoln Highway in Nevada". Lincoln Highway Association. Retrieved March 13, 2008. ^ National Park Service. "Auto Tour Route: Nevada Pony Express". National Park Service. Retrieved March 13, 2008. ^ Lincoln Highway Association. "1924 Map of the Lincoln Highway". Lincoln Highway Association (republished by Practice Press). Archived from the original on February 16, 2012. Retrieved March 13, 2008. ^ Schindler, Hal (December 5, 1993). "The Long And Winding Road—The Lincoln Highway: Utah Played A Key Role In Taming West For Cars". State of Utah. Retrieved January 21, 2009. ^ Patrick, Kevin J.; Wilson, Robert E. "15: Lincoln Highway in Utah". The Lincoln Highway Resource Guide. Indiana, PA: Indiana University of Pennsylvania. p. 203. ^ Benchmark Maps (2002). Utah Road and Recreation Atlas (Map). 1:170,000. Medford, OR: Benchmark Maps. p. 57. § G7. ISBN 0-929591-74-7. ^ a b c Nevada State Historic Preservation Office. "Spooner Summit: Nevada Historical Marker 261". Nevada State Historic Preservation Office. Retrieved June 19, 2013. ^ United States Geological Survey. "USGS Flood Chronology of the Carson River Basin". United States Geological Survey. Archived from the original on September 17, 2008. Retrieved March 16, 2009. ^ United States Forest Service. "Kings Canyon Road". United States Forest Service. Retrieved June 19, 2013. ^ Massey, Peter; Wilson, Jeanne; Titus, Angela (2008). "24: Spooner Summit Trail". Nevada Trails West Region: Backroads & 4-Wheel Drive Trails. Adler Publishing. pp. 174–177. ISBN 1-930193-15-7. Retrieved January 26, 2013. ^ Nevada Department of Transportation (1934). "Fallon, Nevada". Nevada Department of Transportation. Retrieved February 18, 2009 – via forgottennevada.org. ^ Road Atlas (Map). H.M. Gousha Company. 1967. p. 45. Retrieved January 27, 2008 – via Broer Map Library. ^ Deach, Ben (August 2, 2017). "Freeway Extension to Save Drivers Time in Carson City". KOLO-TV. Retrieved January 20, 2018. ^ Marroquin, Art (July 13, 2018). "Public Meetings on Future of I-11 to Be Held in 7 Nevada Cities". Las Vegas Review-Journal. Retrieved March 27, 2019. ^ Alonzo, Amy (July 26, 2018). "Interstate Connecting Canada, Mexico Might Pass near Fernley". Reno Gazette Journal. Retrieved April 23, 2019. ^ Google (January 31, 2009). "US 50 Douglas County" (Map). Google Maps. Google. Retrieved January 31, 2009. ^ Google (January 31, 2009). "US 50 Lyon County" (Map). Google Maps. Google. Retrieved January 31, 2009. ^ a b c Nevada Department of Transportation. NDOT Maintenance Districts and Mileposts (PDF) (Map). Nevada Department of Transportation. Archived from the original (PDF) on April 25, 2013. Retrieved June 19, 2013. ^ Google (January 31, 2009). "Churchill County" (Map). Google Maps. Google. Retrieved January 31, 2009. ^ Google (January 31, 2009). "Lander County" (Map). Google Maps. Google. Retrieved January 31, 2009. ^ Google (January 30, 2009). "Eureka County" (Map). Google Maps. Google. Retrieved January 30, 2009. ^ Google (February 1, 2009). "White Pine County" (Map). Google Maps. Google. Retrieved February 1, 2009. ^ Google (February 1, 2009). "Ely to Baker" (Map). Google Maps. Google. Retrieved February 1, 2009. 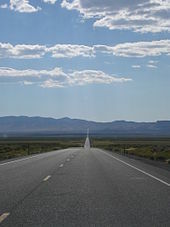 Wikimedia Commons has media related to U.S. Route 50 in Nevada. Wikivoyage has a travel guide for Loneliest Road in America.